The campaign continues to ramp up in volume during the past hour as we publish this post. 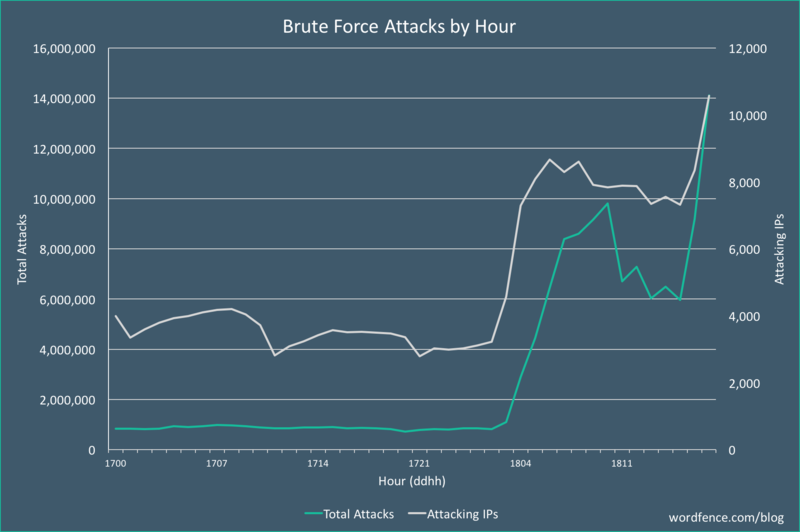 A graph of the attack volumes is shown below which shows the number of attacks per hour and the number of attacking IPs that we see each hour. Our infrastructure automatically blacklisted the participating IPs in real-time and distributed those to our Premium customers. This all happened unattended early this morning. We continue to monitor the campaign and are analyzing its origin and who is behind it. On December 5th, a massive database of hacked credentials emerged. It contains over 1.4 billion username/password pairs. Approximately 14% of the database contains credentials that have not been seen before. The database is also searchable and easy to use. 50 Comments on "Breaking: Aggressive WordPress Brute Force Attack Campaign Started Today, 3am UTC"
We noticed a sustained load increase across our servers. Upon investigation we found the same things, a large amount of IPs hitting WP login pages and xmlrpc.php. We have systems in place that automatically block these attacks / IPs for any WordPress sites not using Wordfence or who may not have it configured for this protection. It is rare I need to start manually blocking ranges but this is one of those times! Thanks for the article I will be sharing it. Thanks for the heads-up. Awesome work! In addition to WordFence on likely-to-be-vulnerable domains, I find that fail2ban is an excellent solution against this type of attack. An aggressive, brute force attack against one WordPress site on a server will get an IP jailed not just for that site, but for all sites on the same server, WordPress or otherwise. But in all seriousness, thanks for the update and an amazing security plugin. I think, in such emergencies, you should immediately update the blocked IPs for everyone. It is absolutely legitimate to make money with your service, but in emergencies, security for everyone is a greater good. I'd love to do that. Unfortunately producing the list is expensive. We need to collect a huge volume of data on servers which costs us hardware, bandwidth, people. Then we need to analyze it which costs us a large scaleable cluster which aggregates the data and runs queries continuously. Then we need to distribute the blacklist in real-time. Costs are: bandwidth, hardware, software, services and mostly people. If we gave it away for free, it wouldn't exist for very long because we would not be able to continue to afford producing the blacklist, along with the other amazing WF premium features. We've long had a philosophy where we only charge for things that cost us money. I feel pretty good about that because in each case, we HAVE to charge, rather than just doing it by choice. We also try to keep our price-point as low as we can to provide a huge amount of value for our customers. I've been seeing a lot of dummy email addresses for subscribers lately. Not sure if related to this attack. I've been deleting them periodically. ...and in reality, wordfence is pretty fair price for the quality of the plugin, and the ongoing effort you guys put into it. Thanks for the update, and the protection! Maybe you should publish those IPs you've found. We don't publish our IP blacklist publicly. It is available as a Wordfence Premium feature. You are 100% on the ball with that. In a situation like this EVERYONE should be 100% protected. I am going to have to disagree with you there Greg. It is not some kind of right you have to get premium services without paying for it. You don't get to demand someone else's services when you think you have the right to them. I use the premium plugin on all of my client's sites, and some of my own personal sites. Some smaller sites that I don't have as much of an investment in just run the free version. But I do not expect the team at WordFence to cover me with premium services when I do not pay for it. Premium is totally worth it. Thanks for such a great plugin and great service! Gracias por el aviso, mas eficaces imposible! EXCELENTE SERVICIO. Wouldn't it be better to forget about Wordpress altogether and have a much faster completely secure site by using a static site generator like Hugo? That is not feasible for many. That's unfortunate because so many are affected unnecessarily. A little education about how easy it is to have a static website with all of the dynamic functionality handled by microservices would enhance their web presence dramatically. Saving them time, money and aggravation. static websites may be more secure however they are also unusable to most clients who want to do their own updates and work. We stopped doing all static sites 18 months ago for this reason. Sites need to be fluid and changing and easily accessible to the non technical. it is not all about security. With 30% of all websites now running on WordPress why on earth would we switch to Hugo. Thanks Wordfence for the brilliant work you do for all of us. Weeeelll, so I think the WP team to a pretty good job of marketing. Lets put it that way. Static sites do have some benefits, but that's if you are just publishing content. If you want a web application that is dynamic, WP is the way to go. So there's a place for both and I certainly welcome diversity in platforms. Wonder if this brute force attack has anything to do with the Internet backbone problems being reported by Level 3 and Cogent today? Thanks for the updates guys, it's great to be as prepared as possible. It's not 7 PM PST yet. Is this report from the future? 7pm PST yesterday, 3am UTC today. I have no doubt for one second that the attacks are timed when staff are preparing for the holidays and some downtime. It was this time last year my server was heavily bombarded with Brute Force attacks. 3 client sites were compromised. New Year's eve plans were put on hold because of this. Could be the same again this year. Hope his doesn't ruin your plans!! Thank you for helping to keep the WWW a more secure place for everyone! Thanks for the support and heads up Mark. This rubbish is exactly why I will no longer use WordPress. Just this week I have already shifted my sites across to another platform. I feel for everyone who has no idea on the simplest security measures, including the free level of Word Fence let alone paying for the Premium version. It's not what it costs up front, but the cost to repair, replace or fix what has been lost. Sorry to hear that. I do think it's possible to reap all the benefits of WP and also secure it. Wordfence runs WP and I run it on my personal sites. Whatever you switched to has its own security issues. The attacks can also put a smaller load on those servers too (if the attack is dumb and target all sites). Do you have any feed with malicious IPs/attacker’s? Hi Eduardo, our real-time IP blacklist is that very feed. You can enable it on your site by enabling the "Preemptively block malicious IP addresses" option in the firewall. It's a Premium feature. Wow - thanks for keeping on top of this, and for letting us know. This sort of thing isn't a problem with WP per se, it's just a tradeoff of dynamic sites. Sure, generated static sites can be great, but folks often expect/need more than those can provide cost-effectively. Same reason they tend to favour cars even when walking would be safer. I also found that these issues on the Backbone and Cogent servers are related to a significant brute force attempt through TightVNC clients. The attempts have been discovered for short periods over the past 10 days, but have increased to many thousands of attempts on many IPS across our network. My site was also under brute force attack. All the IPs were from Vietnam and they were all different. I received atleast 100 emails from my site about blocking of brute force login attempt by WordFence, and I am using Free version. The Cloudflare/cloudbleed breach actually showed that 1password is fairly robust. That was not a 1pass flaw but a Cloudflare issue. The second article makes a lot of noise about things that could be improved in password managers in general. 1pass is doing a pretty good job as far as I'm aware. Sure, you're going to get the odd vulnerability reported, but that applies to anything. You state: "The 1password is not secure at all". That is factually incorrect. At the time of this writing, 1password does not have any outstanding vulnerabilities or other security issues that I'm aware of. Thanks for the update. I wish we could afford the premium but with 1500 sites to consider it's just too much. Even the bulk pricing. That being said you have 10,000 IP's firing at 14 million wordpress sites. This may be a stupid question but why aren't we firing back. 14,000,000 sites shooting queries back at these IP's would/should take down those servers instantly. To hell with the hosting companies taking the money and looking the other way. To hell with the governments that refuse to make this a priority issue in their law enforcement. To hell with collateral damage. With 14 million wordpress sites we could be the botnet from hell! If my sites go down because my host is allowing hackers to use it well we're going to be having a discussion about their future with us. The CFAA does not allow us to hack back, unfortunately. I'd love to see the country demographics for this attack like you used to show. Where is it originating, which countries and Ip's? Hi Joe, Thanks for the feedback. We'll consider adding that detail if we publish a follow up post. Hi, does anybody have any clue if this is still on? Hi Enrico, attack volumes are very low this morning. Check out our post from yesterday, there is an update including a graph toward the end. Hi Dan, thanks for the answer!